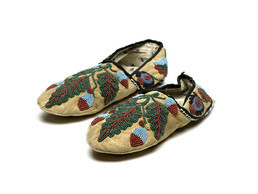 These moccasins were sewn from soft-tanned deer or caribou hide and beaded with striking leaf, flower, berry, and nut or catkin designs. The designs may be fanciful, rather than representing real plants. People of the southern Yukon region, including the Inland Tlingit, constructed moccasins of this type, with T-shaped heal seams and blunt toes. This pair was collected on the coast at Sitka, reflecting trade between coast and interior groups.